Social networking sites such as Facebook and LinkedIn are some of the most powerful tools available to recruiters today. Your company may see the potential for social recruiting or may be using tools today, but a social recruiting strategy needs to be part of overall company goals and objectives to deliver true return on investment (ROI). If you're not sure where to start, this paper will outline why social recruiting is becoming an imperative for companies today and how you can get started in reaching highly qualified candidates and passive job seekers while building company brand recognition and reducing sourcing costs. 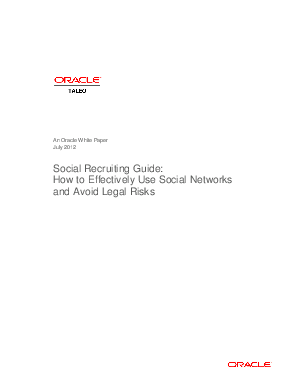 While social networks can give recruiters a competitive edge in locating and engaging the best candidates available, adding these new sourcing options also brings potential legal pitfalls. Organizations need to be aware of these risks and how to mitigate them while leveraging this important tool to reach your recruiting objectives.